Rory Johnson-Hatfield, 29, from Skipton was last seen three weeks ago in the City Mills area. His family is appealing for help to find him. The father of a man who went missing after a night out in York has issued an emotional appeal for his safe return. Rory Johnson-Hatfield, 29, from Skipton was last seen three weeks ago in the City Mills area. His family arranged additional searches of the River Ouse, with the York Rescue Boat, after police searches were suspended due to flooding. Doug Hatfield said Rory's disappearance had "left a hole" in the family's heart. The father of missing man Rory Johnson-Hatfield today appealed for further information about his son’s disappearance in York. The family of a man who went missing in York two weeks ago today are organising further searches of the River Ouse. Rory Johnson-Hatfield, 29, from Skipton, was last spotted on a night out in the city. Police have released CCTV footage of his last known movements. Now his family has arranged to conduct additional searches of the River Ouse with York Rescue Boat and International Rescue. Today, North Yorkshire Police released further details of Rory's last-known movements. Rory was last seen by a friend at 12.15am on Friday, 20 November when he left the York Central Travel Lodge on Piccadilly, where he was staying. Rory went to a nearby pub with a fellow hotel guest, having earlier met him and his father in The Postern Gate Wetherspoon pub at around 11.30pm on Thursday. Rory left the pub at about 12.30am. However, he never returned to the hotel and he failed to turn up for work in Skipton on Friday evening. One line of enquiry is that Rory may have got into difficulty while walking near the River Ouse in the City Mills and Skeldergate Bridge area after midnight. His family has identified him on CCTV footage taken in the area shortly afterwards. It's been almost two weeks since Rory was reported missing and our enquiries remain ongoing to establish the full circumstances. We urge anyone who has not yet come forward with information to get in touch immediately. We are continuing to support Rory's family at this very difficult time." 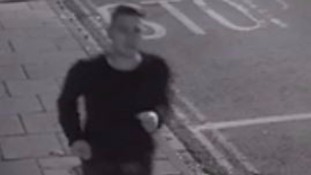 Police have identified Rory Johnson in CCTV taken at 12.47am on Friday 20 November - the night he went missing. The footage shows Rory in the City Mills area of York. Police are following all lines of enquiry and resumed underwater searches yesterday. Police are continuing to appeal to anyone who recalls seeing Rory or someone matching his description in York on Thursday evening or Friday to contact them. Rory is white, aged 29, 5ft 11in tall, slim build, with short blond hair. He was wearing a round-neck black top, blue jeans and white and navy trainers. Anyone with any information should contact North Yorkshire police on 101. Searches of the River Ouse in York will continue today as part of the enquiry to find missing Skipton man Rory Johnson. The search was were postponed yesterday due to adverse weather conditions. Rory's family have been made aware and are being supported by specialist police officers. The investigation is continuing today with officers following up enquiries and reviewing CCTV footage. Police are appealing for anyone who recalls seeing Rory or someone matching his description in York on Thursday evening or Friday to contact them. Police searching for missing Rory Johnson in York have released future information about his disappearance. The 29-year-old from Skipton went missing on Thursday night, into Friday morning. 11.30pm: Mr Johnson was at the The Postern Gate Wetherspoon pub - where he met someone (a hotel guest) and their father. Midnight: Mr Johnson returned to Travelodge (York Central) with the two people he had met. Mr Johnson was staying the night there with his friend. 12.15am: Mr Johnson left the hotel with one of the hotel guests he had met at the pub to go to another pub (unknown at this time). 12.30am: Mr Johnson went missing. The person he had met assumed he had gone to the toilet or returned to the hotel. Police divers and York boat rescue are extensively searching the River Ouse. Sonar searches are underway in an attempt to track down missing Rory Johnson. The 29-year-old was last seen in a hotel in York by a friend. 29-year-old Rory Johnson was last seen by a friend just after midnight on Friday at the York Central Travel Lodge. Today, his friends join police to search the surrounding area. Anyone with any information about Rory, or if you think you have seen him, the advice is to contact police on 101. The search for a missing man in York will resume on Monday morning, according to search and rescue teams. Rory Johnson, 29, from Lytham St Annes, has not been seen since 12:15am on Friday morning and was reported missing on Saturday. The Humberside Police Underwater Search Unit and York Rescue Boat have spent the day searching a section of the River Ouse and will continue tomorrow morning.